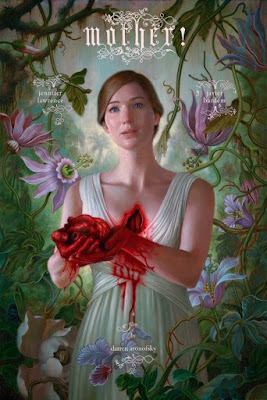 The best way to describe the experience of seeing Darren Aronofsky mother! is like being forcibly thrown into a giant washing machine in which every cycle is as fast-paced and as raucous as its predecessor, and where you are tossed about, wrung out and hung to dry without ever having a say in what’s coming next. If this sounds like the kind of thing you might be into, then buckle up because you’re in for a hell of a ride. Javier Bardem and Jennifer Lawrence play two unnamed characters, he a successful published author suffering from chronic writers’ block; she his much younger doting beautufil wife and the “mother” of the title. After losing everything in a mysterious fire, Bardem’s character, we are told, was brought back from the brink and nurtured back to life by Lawrence, who has even taken on the painstaking task of restoring his house back to its former glory. The couple have since lived in complete isolation in a middle of an idyllic meadow away from prying eyes, until a mysterious arrival changes their lives forever. At the door is an old man (Ed Harris) who claims to have mistaken their home for a Bed and Breakfast. As the man is warmly welcomed by Bardem, Lawrence is rightly creeped out by his familiarity and is a little dismayed at having to welcome a complete stranger into her beautiful home. Things get even weirder when the next day, the man’s wife arrives uninvited and makes herself at home, swiftly followed by the couple's two grown up sons. All of this is taking place under very unusual circumstances, where Jennifer Lawrence’s character appears to be suffering from an undisclosed malaise which can only be made better by her regular ingestion of a mysterious yellowish powder, the mysterious medicine seems at times like the only thing that is keeping her from descending into a hellish version of her own existence. From here Aronofsky takes us into a voyage of the weird and wonderful where no boundaries are left unbroken. His beautifully crafted vision of a nightmarish world starts to take shape, and soon we realise that this is so much more than we were lead to expect. With shades of Bunuel’s The Exterminating Angel, Fellini’s 8½ and a hint of Von Trier’s Antichrist, mother! plays with preconceived notions of filmic standards, managing to alienate one second and impress the next. The film feels at times like a particularly vicious anxiety dream from which one is unable to wake, and where all norms have been deliberately tossed aside. Lawrence is beyond thrilling, she is pushed, shoved, punched, spat at and is finally made to feel like she is the crazy one. She conveys this horror so beautifully for someone who is barely out of their mid twenties. While Bardem turn as menacing and at times truly terrifying character is faultless. Aronofsky throws everything at the script and if that wasn't enough, invents new ways in which to alienate or beat his audiences into submission, all depending on whether you’re in the “hated it” or “loved it” camp. mother! might anger those who are unwilling to succumb to its director’s particular brand of filmmaking, he is brash, forceful and at times simply baffling, but for anyone prepared to give its a chance, mother! is without a doubt Aronofsky’s most complete work to date. It is violent, infuriating and not to mention borderline insane, but it remains one of the most impressive pieces of filmmaking you are likely to encounter this year. While mother! may not always be pretty or coherent, it certainly is one of the most visceral experience ever. So just sit down and let it wash all over you, and whatever you do, do not commit to an opinion before having fully assimilated its contents. Believe the hype!